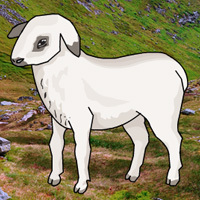 BigEscapeGames - BEG Big Mountain Lamb Escape is another point and click escape game developed by Big Escape Games. In this game, you came to see the beauty of mountain land. But unfortunately, you noticed that someone trapped a mountain lamb in the place. You have to find the way to rescue the lamb from there by finding useful objects, hints and solving puzzles. Click on the objects to interact with and solve puzzles. Good luck and have fun! colour squares driving me nutz..
Don't worry about the dino skull not going in its slot at first. You have to make it orange in the second set of scenes first. searching for second set of symbols at end. I've got the ones with a magician, but not the ones with a rabbit in a hat. moved them around a bit and the puzzle opened. The other part was in the other set. In scene with 4 flowers as color hint.